Accommodation options include Double Room with Private Bathroom, Luxury Triple Room, Twin Room with Private Bathroom, Deluxe Family Suite. Three Palms Lodge is just 2 minutes walk from local shopping and dining options. 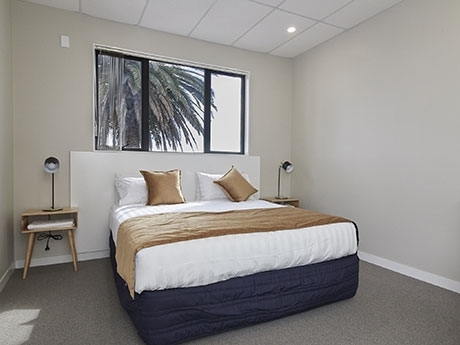 It is just 8km from Auckland Airport and 13.5km from central Auckland. Within a few minutes drive are the Manukau Velodrome, Clover Park, Vodafone Events Centre, Rainbow's End theme park, Auckland Regional Botanic Gardens and Mount Smart Stadium. The Lodge is just 8km from Auckland Airport and 13.5km from central Auckland. Accommodation options include Double Room with Private Bathroom, Luxury Triple Room, Twin Room with Private Bathroom, Deluxe Family Suite. All accommodation includes TV with satellite channels, refrigerator, microwave, tea/coffee-making facilities, iron, iron stand and a hairdryer. All rooms are non-smoking. All 18 lodge guest rooms are Luxury Ensuite. We provide laundry and drying services with additional charges. You can prepare a meal using the communal kitchen facilities or meet fellow travellers in the shared lounge area. Free WiFi and free parking are provided.